As soon as I saw this home, I fell madly in love, so I absolutely have to share it with you. 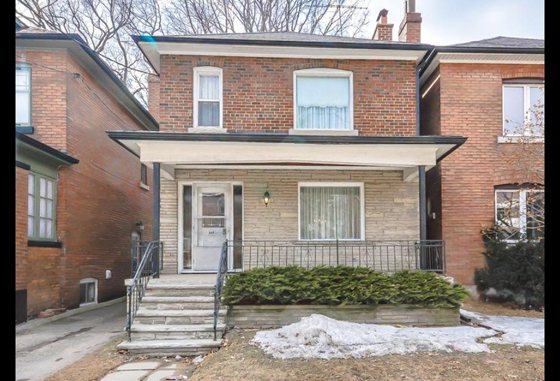 The front of this house in Toronto is totally unassuming, but inside is an absolute treasure trove of vintage awesomeness, virtually unchanged since the 1950s and 1960s. The 96-year-old homeowner has put this house up for sale after living here for over 70 years. She doesn’t have any formal interior decorating training, but she definitely has an eye for style. Take a look. The entryway. It doesn’t have to be your style to be able to recognize how much style it has, and how it is perfectly done for what it is. That wallpaper is pretty fab. The living room. Most of the house is decorated in shades of pink, purple, seafoam and aqua — so basically everything I love in the world (minus purple). I just LOVE this room. Again, the furniture isn’t my style, but the use of color is perfection. The kitchen. 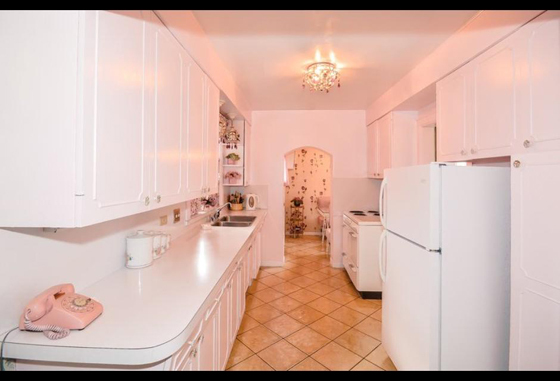 It’s definitely retro, but it has been taken care of so well that I wouldn’t even call this kitchen outdated. With maybe just new appliances, there’s no reason to change anything else. And that pink rotary phone has got to stay. The master bedroom. Ahhhh!! I don’t love purple, but I absolutely love the way the complementary shades are layered, lilac on lavender, and then BAM, that teal velvet armchair just makes the room. It’s a showstopper. The guest bedroom. So. Much. Pink. This is the homeowner’s favorite room. And then, in case you were getting a sweet tooth from all those pastels, the basement bar. Andy was skeptical of this whole thing until he saw this room. 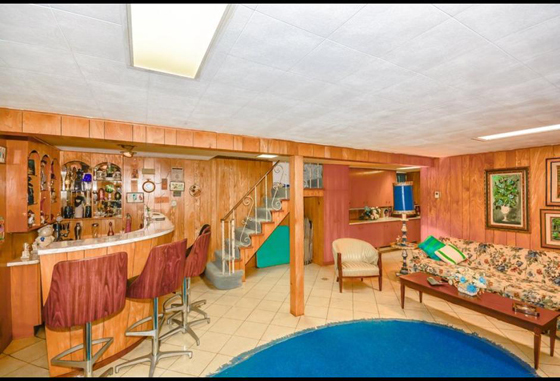 The wood paneling, those bar stools, the royal blue and emerald green. Sold. This house is so inspiring to me. First of all, the use of color is brilliant. 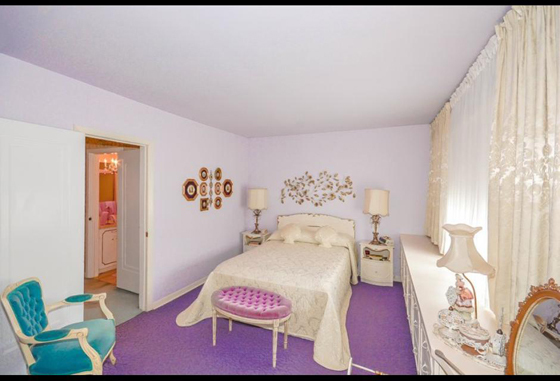 I also love that this homeowner has such a sense of personal style that she hasn’t felt the need to change anything in 50 years. 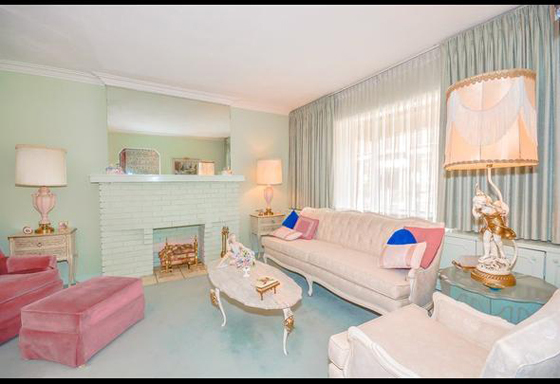 I like change too much to ever live this way, but I definitely am a little jealous of someone who declared a house done in 1965 and hasn’t changed it since! 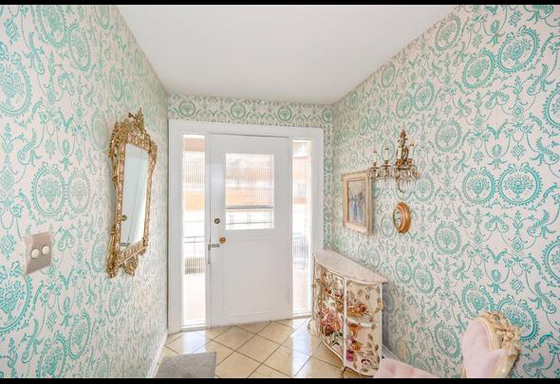 There’s a lot more photos of this house on HGTV.ca, including the amazing bathrooms, and the whole thing could by yours for $699,000 CDN!! What do you think? Do you love this house as much as I do or do you think it’s just way too over the top? I’d love to hear what you think! Kerry, I am in total love with this house too! I can’t even explain how I felt when I saw these pictures. Everything is perfect! If I had $699K right now, I would not even blink at spending it on this house! Then I would not live in it or touch it for another 72 years. Gorgeous! 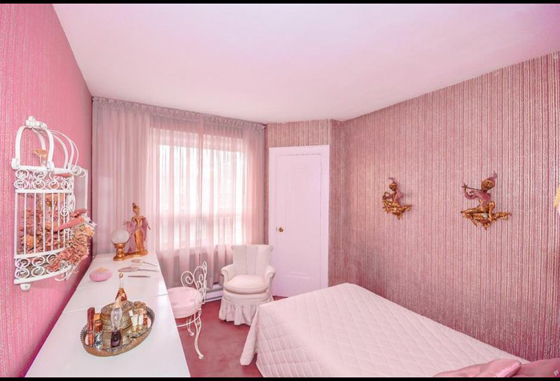 You need to check out the blog “Retro Renovation” because it is full of stuff like this. I’m not even joking.